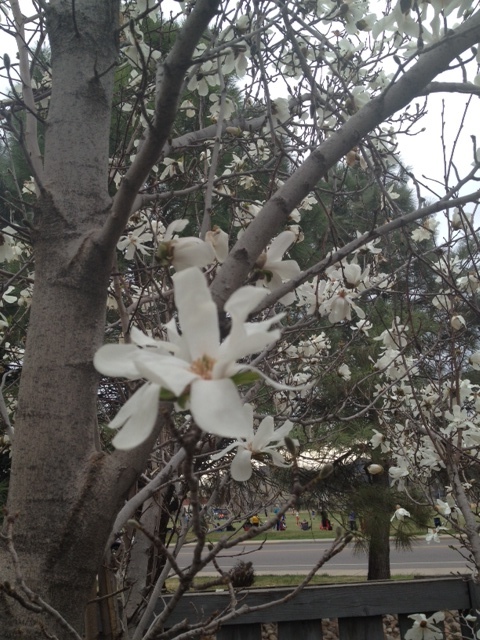 Aren’t these blossoms beautiful? Pleasing to the senses? The internet is blowing up with pictures of blossoms, and people asking us to stop and appreciate these delicate, short lived pops of beauty. I am loving all of the flowering trees that are coming up around town, even if they are making me sneeze and the Zyrtec come out in full force. What I love about this picture too, is that if you look into the background you can see parents waiting and watching as kids play soccer. What you can’t see are the sounds those parents are making. The house I grew up in backs right up to a small neighborhood park, and the cheering voices of soccer games drifted into my family’s life to become the sound track of Saturday mornings in both the spring and fall. It is comforting to know those games are still happening, and even more comforting to know that I sometimes get to hear that soundtrack again. Can you tell I’m balancing between growing up and finding comfort in my roots? Maybe that’s an underlying theme here that I didn’t anticipate noticing about myself. Anyways, I love these blossoms. The day after I took this picture we got a spring snow. Welcome to Colorado, right? Where you never know when you can put away those boots and settle into the next season. The snow flakes were thick, and cold, and slushy, and they covered up all of the brave, budding little plants that are trying their hardest to push their way into this earth. I noticed that these blossoms turned inward, protecting themselves from the cold and they drooped a little, shivering as the wind whispered between them, threatening their existence. Sometimes, that’s kinda how I feel on this journey of looking for beauty. Sometimes in life things are feeling really good, positive, like change is being made and things are being accomplished. And then a cold wind blows – an uncomfortable experience, or a harsh word said by a co-worker, and I want to turn inwards, away from the wind, and away from those experiences that make me question my own place in this world. Because goodness, sometimes doesn’t it seem like the world works pretty hard at making us feel small, and unworthy of showing our true beauty. Maybe this journey of exploring beautiful things isn’t always going to feel %100 beautiful – is that paradoxical? I’m not sure I’m communicating exactly what’s swirling around in my head this week. But I know that I am trying my hardest to blossom, to break out of that little protective shell, and stand against the elements and say, “here I am, please appreciate me.” But a part of me knows too, that this beauty comes in seasons; we shrink, petals fall, and then we get the courage and the time and the opportunity to grow and try again and resurface and say, “here I am, beautiful like last time, just a little different.” Oh the lessons nature can teach me. I’m kinda into it. I started some tomato plants this week, and basil, and flowers in a pot. We will see how I do – I’ve never really gardened before. 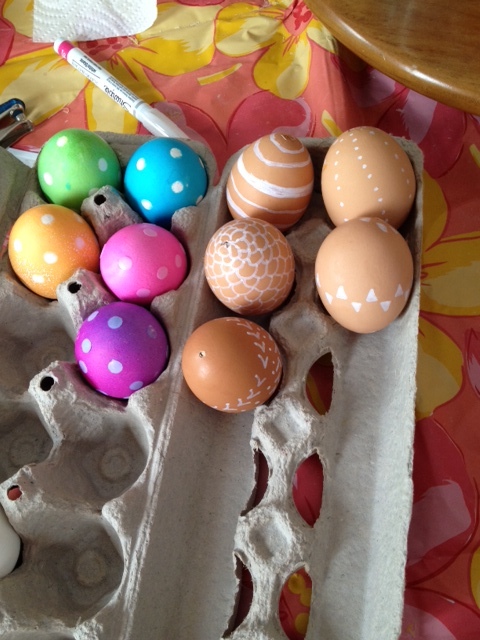 I also got the chance to have fun and be creative with Easter eggs. This is a tradition I’ll never be too old for. This year we just felt a little bit more sophisticated in our design. Thank goodness for Pinterest, and my mom who will still blow out the yokes of the eggs into a bowl so I can decorate the hollow, fragile shell. Again, beauty in the delicate nature of life. And beauty that I didn’t have to get egg goop in my mouth (still a child here… what can I say?) My mom said I should practice for motherhood and start doing these messy things – let’s put the breaks on that one please. Tonight, there is supposed to be a lunar eclipse. I’m not sure I will be able to stay up until midnight to watch it. I’m getting kinda old. Maybe Jimmy Fallon can help. We’ve been watching on Hulu, and that man is funny! I think when I look back on this time of uncertainty, or this stage of life, I will be able to say that this search for beauty and Jimmy Fallon helped to keep me grounded. You never know what is going to come your way. What areas are you growing in? What is threatening your beauty or your place on this earth? What is helping you stay grounded? Also, for a throw back laugh, I thought I’d share this really bizarre picture. 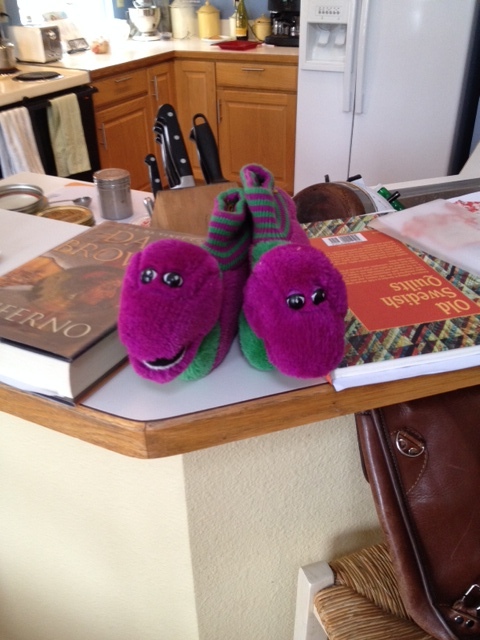 These are my Barney slippers from when I was little.I can’t believe my parents kept them, but they certainly make me laugh. Apparently, I’d never take them off and I had a nightgown to match. Commercialism at it’s finest. Aren’t those little lizards creepy?